Here at the gdgt party, Lenovo introduced an all-in-one nettop we haven't seen before: The IdeaCentre C100 is an Atom-based, 20-inch nettop that will eventually pack Windows 7 and a touchscreen, but it'll have touchless Vista first. The IdeaCentre C100 is a 20-inch all-in-one that'll launch at a price point of, as the Lenovo people told me, "around $400." 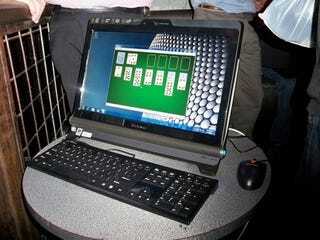 It'll have a 1.6GHz Atom, 1 or 2GB of RAM, a DVD burner and an 80GB-160GB HDD. Interestingly, the webcam and WiFi are both optional, which we suppose is one way to keep the price down.